Another system that goes awry in both pigmented and albino TH-nulls is the gut. It seems likely that their failure to grow is connected with problems with gut function. 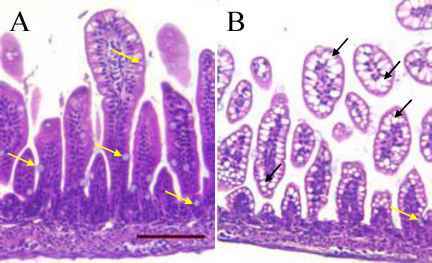 An abnormal phenotype is seen histologically in the gut, most prominent in the small intestine (Figure 2). All cell types have been generated for the gut and are in the appropriate positions in the mutants. More prominent in the TH-null pup than in wild-type are large vacuoles contained in cells in all of the villae of the mutant (examples shown with black arrows in B). These are rarely present in the wild-type. In the TH-null, most of the cells contain such vacuoles. The exceptions are the newly generated cells at the base of the villae. A yellow arrow in B points to a newly generated goblet cell without large vacuole at the base of a villus. The vacuolated cells have been found in all the TH-null pups examined; ages P 9.5 up to P 20.5. The condition does not worsen with postnatal age. The vacuoles are present in all regions of the mutant's small intestine. Figure 2. Photomicrographs of histological sections of ileum stained with hematoxylin and eosin. The tissue sections were taken from a P9.5 wild-type albino pup (A) and a TH-null albino pup (B). The pups were littermates. The yellow arrows in A and B point to goblet cells in the wild-type and in the TH-null tissue. Some of the cells are secreting muscin into the lumen of the intestine. We found pathology in most organs of the TH-null pups that were examined. Another example of damaged tissue, one that has been published, is the adrenal gland . Chromaffin cell structure is altered in the TH-null as was seen at the ultrastructural level. Chromaffin cell vesicles are depleted and an increase in rough endoplasmic reticulum is present in the TH-nulls. The few remaining chromaffin vesicles in the mutant pup line up proximally to the cell membranes. The expression of mRNA for proenkephalin and neuropeptide were increased. Signs of reduced cortical function appear in the mutant's adrenal cortex. Cells contain increased numbers of liposomes. 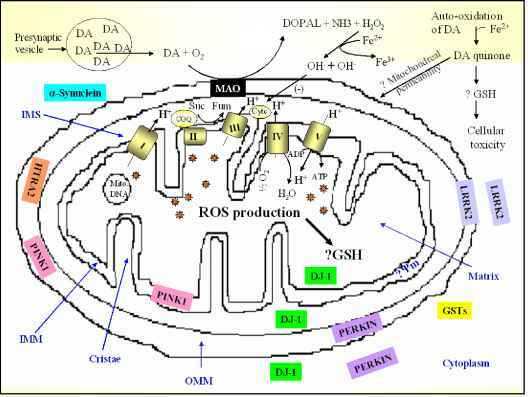 Tubular mitochondria have a reduced mass of internal membranes. Without catecholamines in the adrenal medulla, the adrenal cortex is malformed and corticosterone levels in blood are reduced to 20% of wild-type values. ACTH was not affected . The weight and glucose deficient phenotypes of the newborn TH-nulls are partially prevented by treatment with drugs that supply NE or P adrenergic stimulation. Both L-Dopa and DOPS fortify the TH-null pups, as does isoproterenol. As in the case of the fetuses, administration of L-Dopa, DOPS, and isoproterenol effectively help the TH-nulls to gain weight during the first weeks of postnatal life. Administration of these compounds also rescue the TH-null pups until about 20 days of age. Without treatment many of the TH-nulls die before reaching this age. Regardless of the agent used for their rescue, the mutant pups do gain weight, unlike the untreated nulls. However, the weight gain of the rescued mutants is much less than that of their wild-type and heterozygous littermates. At the end of the third postnatal week, treated and untreated TH-null mutants fail to muster further gains though they do continue to nurse and the mothers permit that. After this event the treated mutant pups lose weight and die, unless they have been receiving L-Dopa. The other rescue strategies allow the mutant pups to live only until weaning. Then life drops its requirement for NE.